Located in the heart of Venice, Atelier Marega will fascinate you for the elegance of the ambient, the exuberance of colours and the quality of the manufacturing. A variety of styles and materials for an ancient art: the papier-mache masks of the Venetian tradition. Also you will find wonderful costumes, for rent or for sale, made to order and custom-tailored, and plenty of elegant accessories to supplement them. 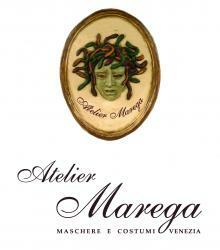 Atelier Marega, the historical and artistic creations atelier, proposes to you its events planning. Indeed in occasion of the Carnival 2014 Atelier Marega organizes it event "Casanova Grand Ball Vices & Virtues" on the 1st March 2014. So let's left the modern clothes in you wardrobe let's wear the costumes of the past.